The Rosewood Paw Embossed Wire Double Diner are especially popular with cat owners, but with two, removable 4.5" dishes they are also great for smaller dogs. 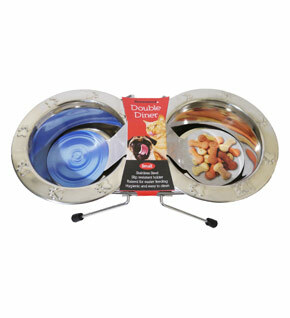 The stand comes with non-slip feet and slightly raises the dishes for easier feeding. Below are some recent questions we've received regarding Paw Embossed Wire, including answers from our team. I am looking for raised feeding bowls for my elderly cats so they don't have to crouch down to feed. What is the raised height of this product? The top of the bowls come to approximately 7cm off the floor. The bottom of the bowls are approximately 2.5cm off the floor.